Hindustan Times has reacted sharply to accusations made by TOI and has refuted allegations of any wrongdoing or misrepresentation of IRS numbers. The latter had accused HT of misrepresenting IRS figures. 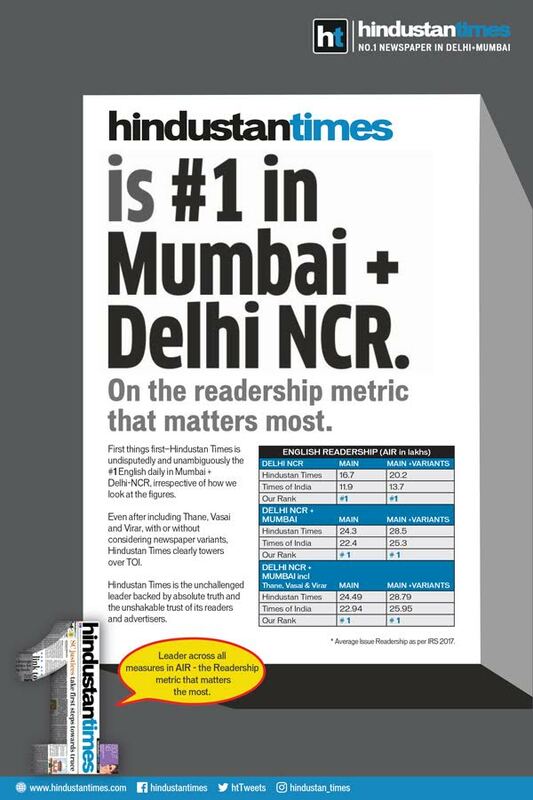 TOI, in a recent advertisement, had accused HT of conveniently using variants and omitting Thane + Vasai + Virar from Mumbai’s readership data to claim leadership in Mumbai+Delhi NCR. Reacting to TOI’s claims, HT has shared a fresh set of data with and without variants and Mumbai market including Thane + Vasai + Virar and claimed that HT is a clear No.1 in Delhi NCR + Mumbai on the basis of the Average Issue Readership. With readership numbers of Haryana available now in the IRS software, HT has claimed leadership in Delhi NCR with an AIR of 20.2 lakh against TOI’s 13.7 lakh that includes Gurgaon where HT has retained leadership. “Hindustan Times has always believed in focusing on credible, unbiased journalism for its readers and advertisers. These results are only a testament of their unflinching support in critical markets where HT operates,” concluded Bhalla.